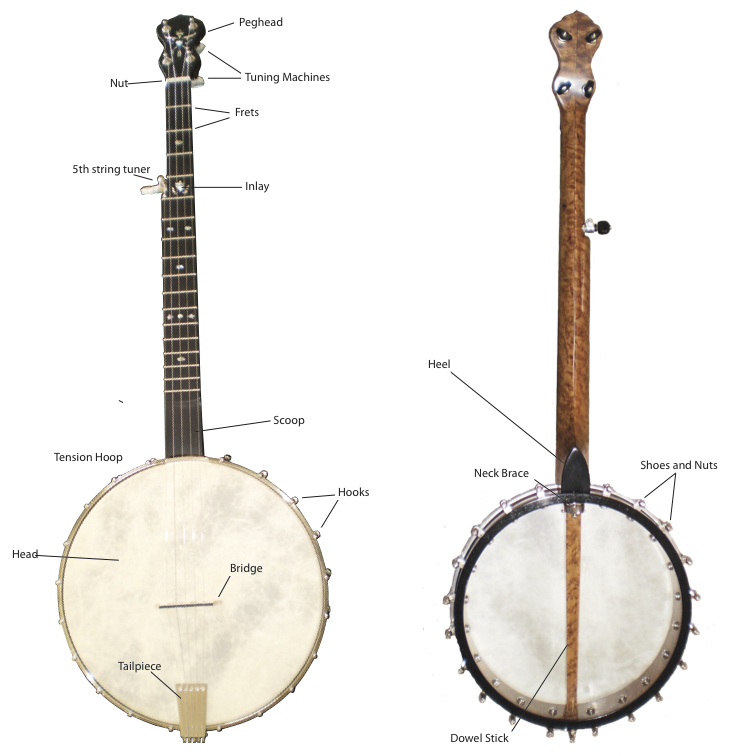 An understanding of the banjo’s parts is essential to banjo making. This diagram displays a banjo with all of its parts labeled. This blog is intended to be accessible to wood workers and banjo people of all stripes and skill levels. If you are completely new to wood working you may wish to consult an introductory manual, tolerant friend, or better yet, get a part-time job in a custom cabinet shop. It is important to become familiar with safety concerns associated with the operation of power tools as it is possible to become badly injured or even get yourself killed from the misuse of a power tool. The biggest dangers in the wood shop are not paying attention, being careless, and failing to think an operation through. My own interest in banjo making developed through playing music and the wish to own a really cool banjo. Although having done some very basic woodworking in my past I was poorly equipped for banjo making. I started out by making “cookie tin” banjos in my living room. The “cookie tin” phase helped me to acquire some of the basic hand tools I needed and helped me appreciate the skill that is required to make good use of them. About that time I was fortunate to become acquainted with Mac Traynham who is not only a great banjo maker and player, but also runs a cabinet shop. With lots of patience on my own part and on the part of Mac, I slowly developed the skills required to make a great banjo. This blog focuses on the construction of 5 string open back banjos. Much of the information here is transferable to other types of woodworking and instrument building projects. Hopefully I’ve broken up the task of making a banjo into smaller tasks that make the whole process easy to understand. There are often many ways to accomplish the same job, the processes here are for reference only. Every shop, tool, and woodworker is a little different so adjust accordingly. Banjo Making is a Process. Think about all of the parts and steps in the process before ever beginning to build. Plan your design. It’s beneficial to have a banjo on hand to use as a three-dimensional model. Whenever you have the opportunity, take special notice of the structural details of other banjos. Studying other instruments will inform your preferences and taste. Every banjo has a neck and a rim. The neck allows for noting and the rim acts as a frame to stretch a membrane across. The membrane, which is commonly called the “head”, acts as the soundboard. The neck and the rim are constructed separately. Bringing these two basic parts together to become a banjo is a challenge and is accomplished by adding a third basic part, the dowel stick. The dowel is found on the inside of the banjo rim. The dowel is rarely seen while the banjo is being played. In the case of a resonator banjo the dowel is almost never seen because it is concealed by the resonator. There are as many approaches to banjo making as there are people who make banjos. Building from scratch is a great experience that requires a fairly extensive tool set and work space. Purchasing and assembling prefabricated parts is also a great approach to banjo making. Regardless of whether you make all of your parts or buy some of them, a look at banjo making processes that work for others will prove helpful.